Nanocomposites based on layered double hydroxides (LDHs) have recently become a formidable research area due to their amendable properties and potential applications. The distinct properties of LDH polymer nanocomposites include a wide range of chemical compositions, structural homogeneity, unique anion exchanging ability, easy synthesis, high bound water content, memory effect, non-toxicity and biocompatibility. This means that LDH polymer nanocomposites have the potential for new and innovative applications. 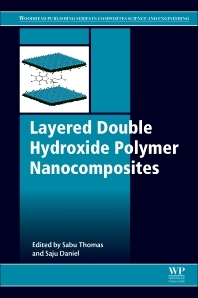 Layered Double Hydroxide Polymer Nanocomposites presents a comprehensive overview of the recent innovative advances in the fabrication, characterization and applications of LDH polymer nanocomposites. As well as covering fundamental structural and chemical knowledge, this book also explores various properties and characterization techniques including microscopic, spectroscopic and mechanical behaviors. There is also a strong focus on the potential applications of LDH polymer nanocomposites, such as energy, electrical and electronic, electromagnetic shielding, biomedical, agricultural, food packaging and water purification functions. This book provides comprehensive coverage of cutting-edge research in the field of LDH polymer nanocomposites and their future applications. This book will be an essential read for all academics, researchers, engineers and students working in this area.